Single pair thermocouple extension cable used to extend the lead lengths of thermocouple sensors. Flat pair thermocouple extension cable is available in a variety of types to suit individual user requirements. 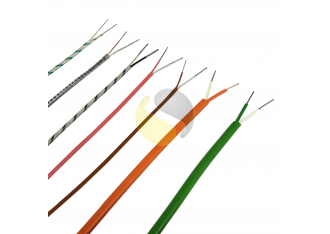 We provide a range of thermocouple wires in types K, J, T, N or R/S calibration, IEC584 colour coded with various insulation materials to suit; including PVC, PFA and Glass fibre, with optional stainless steel overbraid for increased strength and physical protection. We have included a standard range to cover many applications; however we offer many more styles. Full thermocouple colour codes and temperature ratings can be viewed in our technical reference section.